There is no other way to put it Barbra Streisand is both a liar and an arrogant star who has no Idea of how real people live. 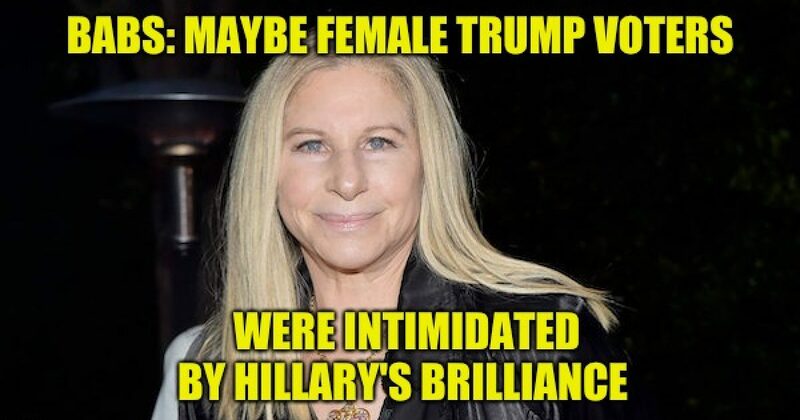 In an interview promoting her new anti-Trump protest album “Walls” Barabra Streisand said that American women were intimidated by former Secretary of State Hillary Clinton’s brilliance and unable to stand up to their husbands in the last U.S. presidential election. ‘A lot of women vote the way their husbands vote; they don’t believe enough in their own thoughts. Maybe that woman who’s so articulate, so experienced and so fit for the presidency [Hillary] was too intimidating.‘Perhaps she made women feel unsuccessful. Huh? It’s incredible how disconnected from regular people Streisand the aging diva must be. She is the anti-feminist if she really believes married women pick the candidates based on their husband’s opinion. They didn’t reject Clinton because she was intimidating, they rejected Clinton because she was a lousy candidate who promised nothing but “same old, same old” with a little bit of the ole’ Clinton corruption in the mix, In the end, they rejected Clinton because Trump was the better candidate who offered a better future. Perhaps Streisand feels unsuccessful because her mother ignored her all her life and according to a cousin who went to school with her in Brooklyn the other students rejected the future Diva because she was full of herself even back then. Barbra Streisand would never understand that women such as my wife who runs her own business raised two children, and who at different times cared for a sick mother, sick aunt, dying brother, and an aging father (and a crazy husband), and fought her own battle with cancer is more successful than Babs or Hillary Clinton could ever be. In my role as a blogger, columnist, and radio host who has attended political conventions and conferences I have met hundreds of women who voted for Donald Trump over Hillary Clinton, not one has ever told me their decision was influenced by a spouse or frighted by what Streisand believes is Hillary’s brilliance. But people shouldn’t expect truth from Streisand. Her arrogant liberal pontification surpassed any appreciation for her singing talent a long time ago. She did say that if Trump won she was going to Australia or Canada. But of course, she’s still here. Perhaps somebody so full of herself cannot fit in an airplane. Truth is that Barbra Streisand is a pampered diva whose contracts stipulates that the Hotel’s staff not turn their backs on, or look directly at the Diva. During a recent  stay at Castletown House in County Kildare, Ireland, Barbra Streisand demanded rose petals in the toilet, peach-colored tissues, and 120 designer bath towels in peach too…because they matched her complexion, according to This Is London. Sorry Babs, but pedals or not, I’m quite sure yours doesn’t smell like roses. She also required 10 specific designer lamps, and requested that the hotel’s security team wear dark sweaters. We wonder if the singing superstar even knew she’d checked into a different hotel once she got to the celeb-centric Dorchester Hotel in London later on in the trip since she’d submitted the same rider to them. Still, all that’s a step above (or in a different direction) from the instructions given to the staff at the MGM Grand to enter and leave the star’s room backwards, so as not to look directly at her. Barbra Streisand is too out of touch and self-centered to become a pundit on any political matter. Perhaps that’s why at a 2017 concert at Long Island’s Nassau Coliseum when she started politically pontificating the audience booed until she stopped, and her anti-Trump protest album Walls sits at #87 (and falling) on the Billboard Top 200 Album list.